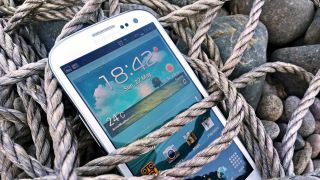 The Samsung Galaxy S3 goes on sale in the UK today - if you've pre-ordered that is - as well as in 27 other countries in Europe and the Middle East. If you got your order in early, you can head down to London's Westfield shopping centre in Stratford, and pick up your handset from the Samsung store. Everyone else will have to wait until tomorrow, when the handset will be on general sale. You can also head down to Samsung's PIN pop-up shops, which have been popping up in London's Westfield in Shepherd's Bush and Old Spitalfield's Market. More locations will be announced soon. According to Reuters, customers in Germany started queuing outside a phone shop in Berlin on Monday night in anticipation. The Galaxy S3 runs Android Ice Cream Sandwich, the most recent version of Google's operating system. It has a 4.8-inch Super AMOLED screen, and new features exclusive to the S3. Pop-up Play lets you watch a video in a window floating above the browser, while S-Voice is a voice-activated personal assistant not unlike Apple's Siri. Smart Stay, meanwhile, keeps the screen lit until you look away, so you won't have to keep prodding it when reading a long article (like our S3 review, for example) or email. Samsung is also giving away tickets to the Olympics to the first 50 people who pre-ordered. If you're among them, head down to the Samsung store in Westfield for 5pm. The phone will go on sale an hour later, so expect plenty of buzz surrounding the launch.